Ceri Forest at Ceri Forest (NRW)0300 065 3000work Forest or WoodlandCeri Forest is a coniferous forest which sits astride the Kerry Ridgeway in the uplands of Montgomeryshire. The Kerry Ridgeway, a long distance regional footpath, runs from near Newtown in Powys to Bishops Castle in Shropshire through the Ceri Forest. The ancient Kerry Ridgeway path is 15 miles (24 km) long, from Cider House Farm, near the village of Kerry, to Bishops Castle in England. It holds a long tradition as a trade and drovers’ route from Wales to the lowland English markets. 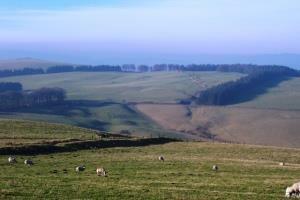 The route follows a ridgetop overlooking Wales on the one side and England on the other. It never dips below 1000 ft (300 m)above sea level, resulting in remarkable views in all directions: up to 70 miles (112 km) on a clear day. Last used regularly by cattle and sheep drovers some 150 years ago, the ancient highway forges a track through airy heather moors, cool woodlands and breezy bilberry-rich heaths. The Kerry Ridgeway's origins are lost in the mists of time but it certainly is older than the Iron Age and Dark Ages earthworks which cut its line. Nearby are Bronze Age burials and a stone circle, all constructed on the high sandstone ridge between the Severn Valley and the upper reaches of the river Teme, a commanding site for countless unrecorded and little understood ceremonies. The route undulates gently throughout, ideal for walkers, horseriders and mountain bikers, all of whom can legally trace this prehistoric way throughout. Above, you may glimpse the glorious red kite (not to be confused with the common buzzard - look for the kite's forked tail). Woodland visitors may include goldcrest and hawfinch, whilst the shy roe deer may fleetingly appear. Later stretches of the route are a kaleidoscope of wildflower blooms in spring and early summer. Ceri Forest is a coniferous forest which sits astride the Kerry Ridgeway in the uplands of Montgomeryshire. The Kerry Ridgeway, a long distance regional footpath, runs from near Newtown in Powys to Bishops Castle in Shropshire through the Ceri Forest. The path is looked after by Powys County Council with main access points from Cider House Farm and Block Wood - check the location map for details.